Q: There is a new residential development being built behind my house and the developer is requesting a temporary easement to construct a retaining wall. The property sits uphill from mine and I am very interested in having ranch style homes built above my property instead of a two-story home. I have asked for ranch style homes to be built as a concession for granting the easement. The developer says that he will do everything in his power to encourage ranch-style development, but will not give me a guaranteed. How far can I push this? Can I flat-out refuse the development company’s request for an easement? What are the types of concessions I might typically expect to receive in exchange for granting this type of easement? A: You can probably refuse to grant the easement. Although some area have certain laws that require homeowners to grant temporary easements to allow construction in tight spaces or to permit better support between properties, if there is no such legal requirement in your state, you may have the absolute right to refuse to grant the easement. On the other hand, keep in mind that the developer may be able to build whatever he wants without your easement. The easement may help, but may not be absolutely necessary. If it’s not absolutely necessary for the developer to get the easement, you may find yourself out of luck in terms of getting your preference for a neighborhood of ranch-style homes. From your letter, it appears that the developer is intent on building more than one home on the lot behind you. You need to determine what you can live with or what would be better for you. If you can influence where the homes will be placed behind your property or what kind of landscaping buffer will be planted, you may be better off trying to make your lot look better than requiring ranch style homes. While a ranch style home has a lower profile, the larger footprint of the home may be closer to your lot line. A smarter move might be to request that the home be placed further away from your property line to give your home more space and light. Look at your property and the neighbor’s property objectively and try to visualize what the finished homes would look like. What would be better for you and what would make your lot more valuable once the construction is finished? You can push the developer as far as you want, but if the developer can build the homes without your easement, you won’t have much leverage. If you decide to grant the easement, make sure that the grant is for a specific amount of time (you want to know when the developer will be on and off your property), and make sure the developer restores your property to the condition it was in before the construction. The developer should also provide you with evidence that they have insurance in case they damage your property. They should agree in writing that their work won’t cause your property harm, and if it does that they will repair it. You should also have a right to see the plans for the retaining wall in advance and approve them so that you don’t end up with an ugly retaining wall at your property line. In addition, the developer should agree that whoever ultimately purchases the house that gets built will have the financial obligation to maintain the retaining wall. If the wall is allowed to fall into disrepair, potentially causing problems for your property, you should have the right to maintain the wall and file a lien against his property for any expenses you incur. Finally, some people request a nominal amount of money for the right to a temporary easement. 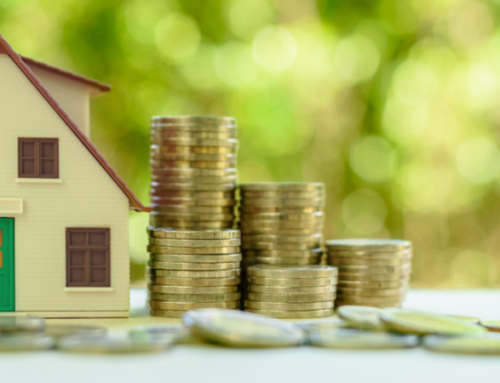 But it seems that money won’t solve your issue of trying to protect the value of your home and having a large bulky structure stare down on your property. Talk to a real estate attorney before you negotiate with the developer. Bring all of the information relating to your property and to the neighbor’s property to the meeting, including pictures of your home and the neighbor’s lot. Be prepared to talk honestly with your attorney about your wishes and where you might be willing to compromise. With all of this information, your attorney may be able to negotiate a win-win agreement between you and your new neighbor.